You don’t have to look far to find inspiration in how Better Business Challenge participants are approaching company-wide sustainability. 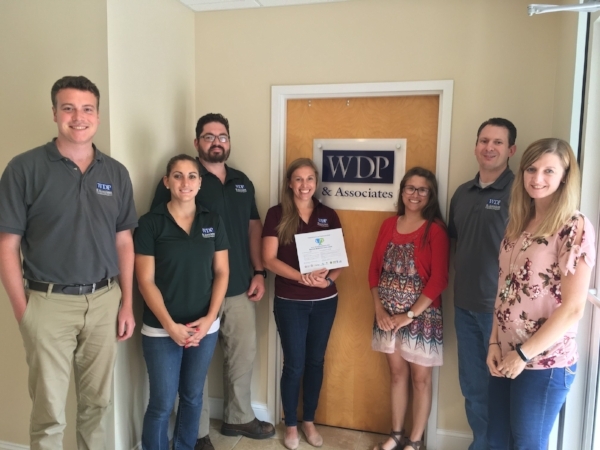 Today, we put the spotlight on local consulting engineering firm WDP & Associates, who are ramping up their game by adopting energy smart solutions in practical and innovative (AND fun!) ways. We asked Jodi M. Knorowski, PE, WDP & Associates project engineer, about some of the steps they have taken thus far to save energy and go green. As you’ll see, they’ve taken actions both big and small. From placing signs around the office that remind staff to turn off lights when they aren’t needed, to surveying all of the major energy-consuming items in their office, WDP & Associates is off and running in their quest to streamline workplace energy use, support the community, and protect the environment. Why did WDP & Associates join the Charlottesville Better Business Challenge? JODI: WDP joined the Better Business Challenge because we were eager to get involved with something that connected us to the local community while finding ways to have a positive impact on the environment. As building envelope consultants, we work to provide clients with solutions that make their buildings perform better, and saw this challenge as a great opportunity to find ways to take our own advice while getting to know some of the other small businesses in Charlottesville. What sort of actions has WDP taken so far to save energy (and money) as part of the Challenge? JODI: So far, WDP has done a survey of all of the major items in our office that consume energy. As part of this survey we are working to identify high consumption items and evaluate potential changes that could be made to reduce that impact. We also placed signs around the office in key locations offering friendly reminders to staff to turn off the lights at the end of the day, or when they are no longer using that space. We have conducted a survey of staff to evaluate their level of comfort within the office. Based on the feedback, it appears there are pretty big temperature swings in different offices, so we are evaluating ways we can monitor the temperatures in each office and propose alterations to the mechanical system to make it run more efficiently and better meet the needs of staff. What sort of energy-saving and carbon footprint-reducing measures are you looking forward to exploring or implementing (as part of the Challenge)? JODI: Because we are one of five offices along the east coast, we have encouraged the other offices in our company to find ways to also reduce their energy consumption. We are hoping this could become a friendly competition within the company as well! We have also discussed bringing more plants into the office to improve the indoor air quality as well as make a more enjoyable space to work. What advice would you offer other local businesses or organizations who may be interested in saving energy, going green, or reducing their environmental impact (in addition to joining the Challenge)? JODI: From a technical and a holistic standpoint, it is important to understand how a building is performing so that modifications that are made can be evaluated to find the best value. It can also be a lot of fun to find ways to reduce energy consumption! Most people don’t shy away from a challenge, so you can have a lot of fun being creative and encouraging people to participate, which will hopefully have more of a lasting impact!